The smallest CowPot currently produced it is great for starting plants that are going to be transplanted soon after sprouting. Vegetable seeds are perfect to start in this CowPot. Once they germinate and live for a few weeks they will be ready to be planted in your garden. The best possible start for your vegetables will ensure your gardens success! 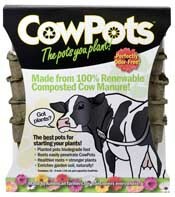 3 inch CowPots are great for starting your favorite annuals for your flower garden and with The Online Greenhouse you don't have to spend alot to make it happen!